Sorry again guys, the last fortnight I've been flat out and haven't had time to do much writing. Don't despair though, I've done plenty of drinking and will be posting quite a few reviews in the coming days. To get back into the swing of things Richo and I decided to drink a few IPA's as pre's before a friends 21st on Saturday. We always do things with a twist and BrewDog's IPA is Dead seemed like the perfect set of beers. This is the second installment in the series and basically the beers take you on a "world hop tour". 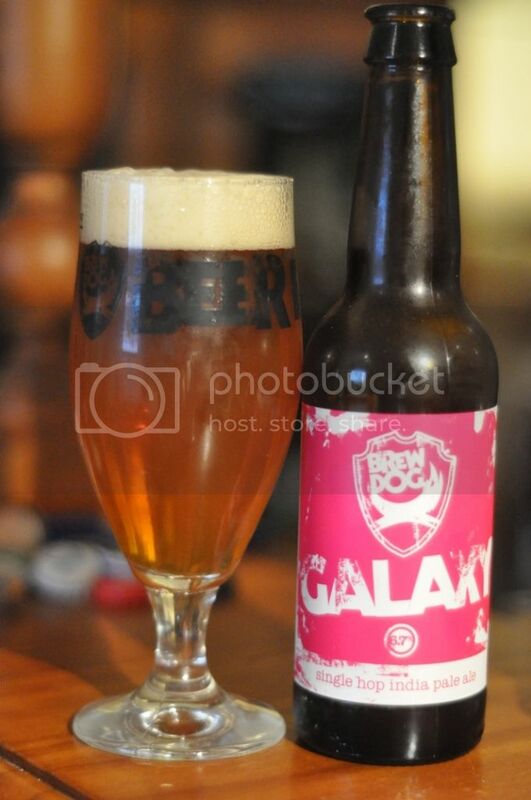 The concept is a simple one and I've taken this excert and the picture above from the BrewDog blog. "The experiment, as before, is simple: Four single hops start out with the same malts, the same ABV, the same IBUs, the same everything, except that each one is made with a different hop strain to showcase their individual character and talent." 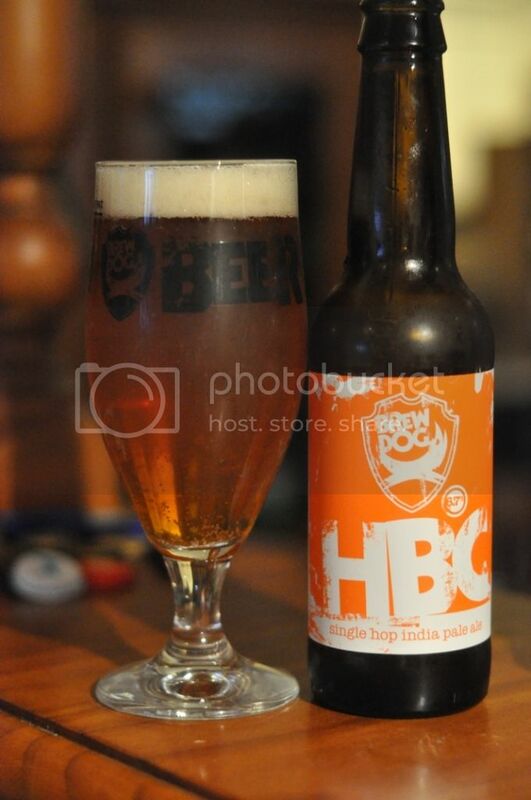 First up for us is North America's HBC single hop IPA. The bar is currently experiencing a few minor electrical issues so apologies for any picture quality issues. The beer pours a golden amber colour with good carbonation rising to the head, which is a tad small for the style. However there is some lacing which saves face for the appearance. Upon sampling this beer I don't think I've had the hop before, please correct me if I'm wrong, however the hop characteristics are very un-American. In both the aroma and the taste I didn't get any of the citrus that I would expect from an American IPA. As stupid as this sounds the hops are earthy and almost malty. It's a really unusual IPA and hard to judge for me because I don't know what the hop is supposed to taste like. Next on our hop world tour we journeyed through our glasses to the home of BrewDog, the U.K., to sample the Challenger single hop IPA. It's a hop variety that I have alot of experience with and is one that I think a number of drinkers would know the taste of even without realising. The appearance of this beer was similar, despite the descrepencies in photo lighting. 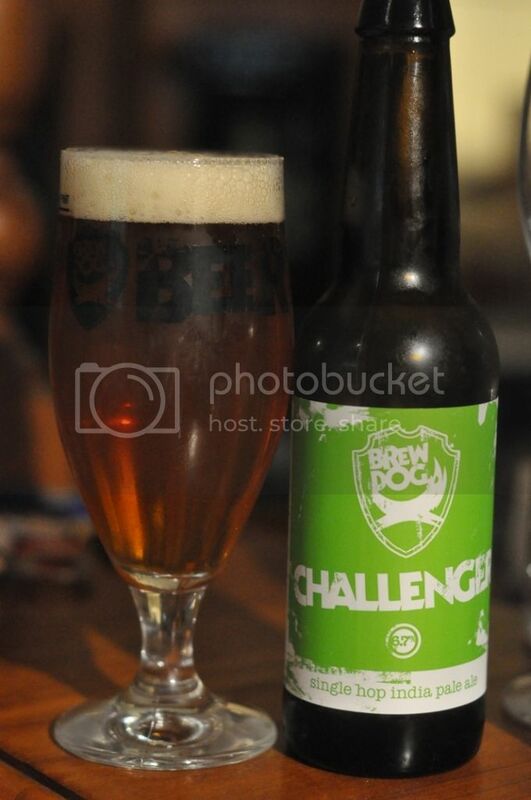 There are all the aroma's and flavours in this beer that I would expect from a beer with Challenger hops and then some! It's one of the fruitiest of the English hops and this example shows that off brilliantly with flavours of orange, grapefruit and lemon all to the fore. The beer started really well and it also showcases the hops well, however it did seem to drag a bit as the beer warmed up. Galaxy is the Australian representative in the IPA is Dead series. This is certainly the hop I am most accustomed to, although almost always as one of a number of hops blended together. The appearance of this beer is a little lighter, not much but it is noticeable, and the head looks a little tighter than the previous two we sampled. This hop variety has a distinct flavour that is clearly "west coast American". It has that distinctive piney aroma and flavour as well as those big citrus flavours that make American IPA's so distinctive. To think this is a world renowned hop variety in our own back yard, which not enough people take notice of. This for me is the pick of the beers so far! 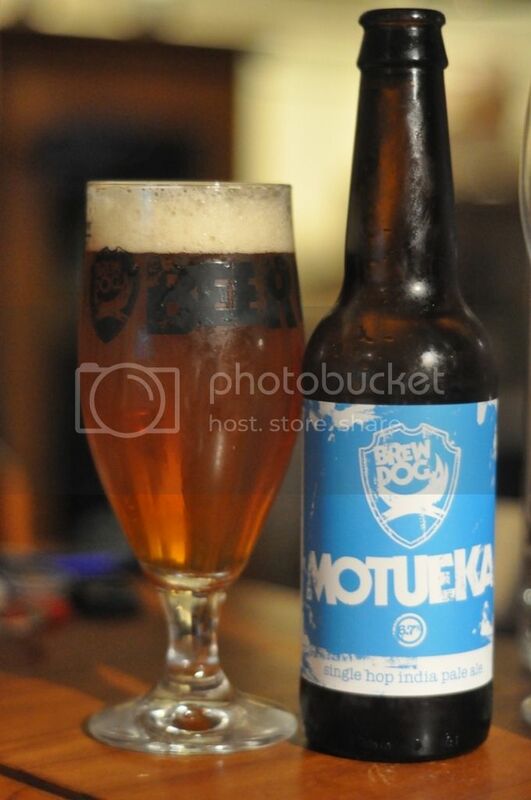 Motueka is a hop variety from our neighbours across the ditch, New Zealand. The town the hop is named after has a population of only around 7,000 people, but this does little to bely one of the most distinctive hop varieties out there. The appearance of this beer is again a similar golden amber colour, however the head is a little darker and has less retention. New Zealand hop varieties have a distinctive "New Zealand" smell. There is lots of tropical fruit on the nose that follows into the taste. Mango and passionfruit are the most distinguishable fruits, with good bitterness permeating the beer. The beer as a whole entity is a little underwhelming however the way it showcases the hops is simple second to none! What a fantastic set of beers to have in a single sitting and trust me with how bad I felt on Sunday morning it was a great start the really got me in the mood to keep drinking. As for a ranking (we felt 1 would be appropriate) we've made the call on which beer we preffered most. My favourite was Galaxy followed by Challenger, Motueka and HBC in that order. A special mention to Motueka which I thought showcased the hops the best, but was let down by the overall compilation of the beer. 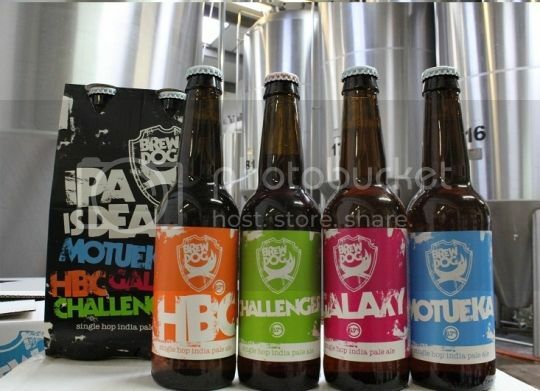 BrewDog have done a really great job with this series of single hop IPA's. Not only do they beautifully show off the characteristics of each of the hop varieties but they are also quite drinkable beers to match. Mikkeller have also done a single hop range of beers, which I will probably have to try at some point in the future. But for now I will thank BrewDog for trying to educate drinkers out there as to the intricacies of the beers they are trying, it can only be a good thing for the continued improvement in craft beer.